If you’ve been wondering where to find that oh-so gorgeous blouse worn by Chinese Peranakan ladies, read on to discover my pick of must-go shops in Singapore. The kebaya has made a comeback in recent years after TV shows like The Little Nyonya showcased the modest, yet tantalisingly sheer silhouette created by this traditional outfit. And if you’ve ever admired the gracious female crew of Singapore Airlines, you might notice French designer Pierre Balmain’s interpretation of a typical Nyona attire, otherwise known as the sarong kebaya. At the opening of my recent show Crossing Cultures in a custom-made Kebya by Benjamin Seck of True Blue Cuisine. See his shop at the Peranakan Museum for both ready-to-wear and exclusive haute couture Sarong Kebaya. 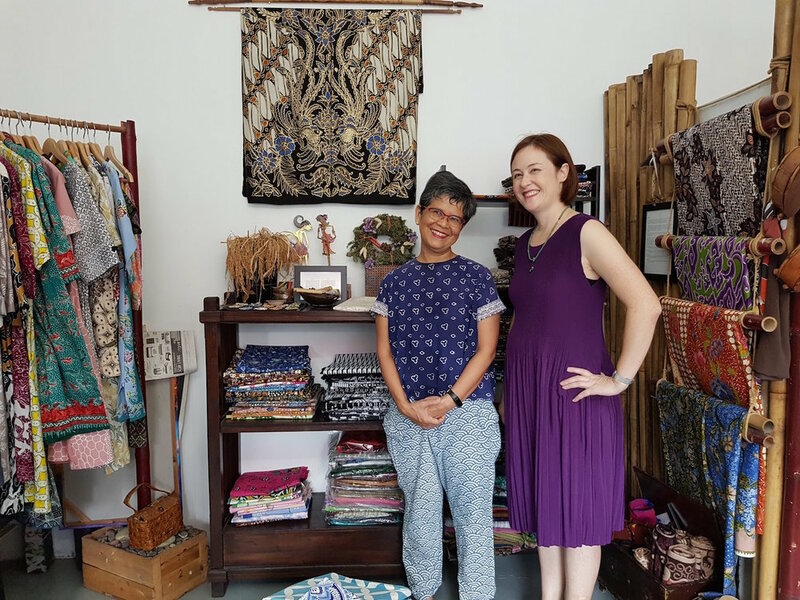 If you're just a kebaya beginner or want to ease yourself into the world of batik and embroidery, I recommend visiting Little Nyonya Batik. Owner Della Ong’s friendly and calming personality will put you at ease at her tastefully decorated boutique near Newton. Della’s has a good range of entry level and mid level kebaya, and you can get a matching batik sarong skirt with a zip for ease. You’ll also find rayon sarongs, which have a wonderful drape and allow you to move with ease. For the man in your life, check out her vivid range of men's cotton batik shirts. Della’s batik silk scarves and shawls also make a lovely gift for friends overseas. By appointment only or visit her online store. Next stop is East Coast Road at Katong! Catch a bus or taxi to Rumah Kim Choo to discover a wide selection of kebaya, many of them created by fashion designer and boutique manager Raymond Wong. A man of discerning taste, Raymond specialises in custom made kebaya and can even incorporate Swarovski crystals and beads into his designs! To complete your Nyonya look, select from a stunning array of beaded shoes and slippers. And if you want to give Peranakan beading a go, Raymond also offers lessons in making your own handcrafted beadwork - sure to be a family heirloom in the making! Rumah Bee Bee is just next door to Kim Choo, so you can easily see her offerings while you are in this lovely neck of the woods. Aside from sarong and kebaya, you’ll also find beautiful belts and kersosong rentai (three-brooch pins) to help keep everything in place. I love her shophouse interior, and especially the Peranakan tiles on the outside - another favourite topic of mine! Be sure to sample her fresh daily snacks too. So many places to jalan jalan...(Malay for 'taking a stroll') on your kebaya outing, you might need to make another date just to visit the Arab Street area. Toko Aljunied should be your first stop at 91 Arab Street, which is a short walk from Bugis MRT. Aside from kebaya of different price points, you’ll also find some glamorous silk sarong. Cotton batik table runners and napkins are also available and make perfect gifts to take overseas. An outfit for your little nyonya is also quickly solved with affordable sarong kebaya sets for children in stock. Make sure to pick up a mini-me sized kerosang rentai brooch for a finishing touch. While still in Arab Street, you might feel like you’re getting closer to the heart of batik. Kiah's Gallery is a cosy boutique specialising in this gorgeous wax dye technique on sarong. Enjoy a relaxed talk with owner Auntie Yati Hairi, who is always incredibility patient when I regularly try everything on! Ready made batik clothing for both men and women is available, and a tailoring service can transform batik clothing into a perfectly fitted outfit for a special occasion. Give three-legged shop cat ‘Kopi’ a pat while you admire hand-drawn sarong or ‘eco’ batik. Auntie Yati also has a very cool Instagram account where she and her clients model the clothes (you might spot me there too!). If you’re near the Somerset or Dhoby Ghaut area, pop in and see author and kebaya connoisseur Christine Ong at the Concord Hotel. Christine’s beautiful lineup of sarongs and kebya can be seen at her stall just outside Spices Cafe inside the hotel lobby. Visit her weekdays from noon to 3pm, or call +65 9798 2176. Christine’s long-time seller Nyonya Kebaya: Intricacies Of The Peranakan Heritage is a great handbook for tips on how to wear and care for kebaya. As the owner of a couple of kebaya or two (actual numbers are not disclosed to my husband), let me mention one more thing - foundation garments are your best friend! A kebaya hangs best on a trim figure, or at least one that’s firmly ‘established’, so to speak. So make sure to get some comfortable shapewear or a camisole with matching coloured bra. Another fun way to wear kebaya is simply over a tank top with a pair of jeans. 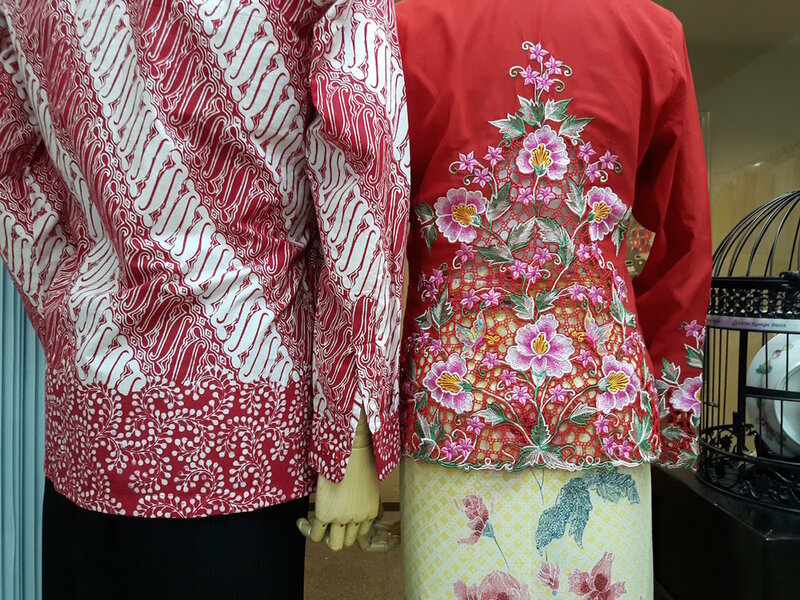 Mixing and matching…the essence of Peranakan culture! If you’ve found this information useful, feel free to post to your Facebook using the ‘share button’ below. See comments box below if you’d like to ask any questions or make suggestions. Thanks for reading! At a play by Peranakan theatre group Gunong Sayang Association with Little Nyonya Batik owner Della Ong.